The Irrigation Products that Blue Sky Irrigation use have been carefully selected over the years to represent the finest that the industry has to offer. When we started installing systems in 1987, there were a lot of companies to choose from. After using virtually every different product, the same ones that we still use were selected. For ten years we have featured Hunter gear drive heads, RainBird valves and sprayheads, and since 2001 the Hunter Pro-C timer. One way to reduce warranty callbacks and service calls, is to use products that run reliably year after year. Shown below are the products that Blue Sky Irrigation uses. Hunter PGP gear drive heads; Hunter introduced this series in 1981, and it has been copied and mimicked, but never equaled. 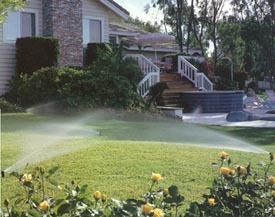 PGP's have the best water dispersion in the business, which leads to a healthy and lush lawn. The internal gear drive mechanism is incredibly reliable, offering ten, even fifteen years of service. There is no substitute for a Hunter PGP head. Hunter PGM gear drive heads; A smaller version of the PGP series, this head was designed for areas that were to small for a PGP, but to big for a sprayhead. It uses the same reliable gear drive mechanism as its big brother, and offers great flexibility in the field. RainBird 1800 series sprayheads; Designed for small turf areas and gardens, RainBirds sprayheads are tough and reliable. They offer the widest array of nozzles in the business, including the VAN series. This is an adjustable nozzle, allowing for watering of almost any odd shaped area. The VAN nozzle was introduced to the industry by RainBird, and has been copied by every other manufacturer. We prefer to use the original. 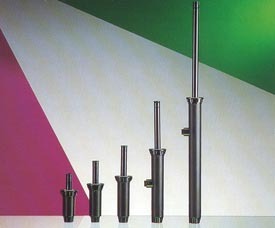 RainBird DV Series valves; RainBird introduced one of the industries first remote electric valves, and have been the leader ever since. These valves are rugged and reliable, offering years of trouble free service. We have personally seen 100 DV valves still in service that were 20 years old. Blue Sky Irrigation refuses to use any other valves. 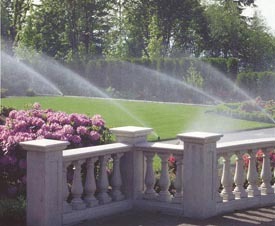 In 2001 Blue Sky Irrigation changed from Irritrol timers to the Hunter Pro-C series. We changed timers because it was felt that a new timer had finally been built that exceeded the features and quality of the product we had been using for 12+ years. This timer was the result of input from contractors and Hunter really did their homework. It is modular in design, meaning it is easily changed from the base 3 station unit to 6, 9, or 12 stations. It has a superior surge protector, and non-volatile memory, meaning it retains time and programs in the event of a power failure without a battery. Three separate programs with multiple start times make it incredibly versatile for all of your watering needs. The Pro-C also has a seasonal adjustment feature, allowing you to change the run times incrementally by percentage (10% to 150%) to compensate for unusually hot or cool weather. A rain sensor bypass switch, large LED display, odd/even watering, and skip days settings are all standard, making this truly a timer for the new century. MiniClick rain sensors; The MiniClick is the industry standard, and is accurate and reliable. It offers settings from 1/8 of an inch, to one inch of rain, allowing you to set it to your own needs. 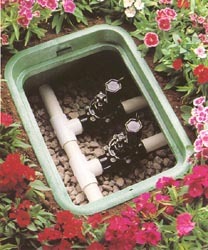 They can be left outside all winter, and require no maintenance, making it a required item for any sprinkler system. The original wireless rain sensors were unreliable, and required batteries that would only last from 1 to 3 years. 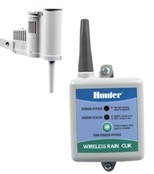 Hunter has now introduced a batteryless wireless sensor that actually works. Additionally, it will cancel watering cycles almost instantly, and can be moved to a different location easily by the homeowner, as it has no wires. We still use the original Mini-Click sensor in some applications, but for the most part have switched to the wireless model.